Developers are trying to keep the intrigue and keep this information secret in order not reassuring or not disappointing their fans. But anyway some rumors have already started to circulate about the new GTA 7 Location. The map will be consist of several U.S. states or consist of a small country outside of the United States of America. This rumor is probably the most plausible because it fits into the overall concept of the game. In addition, Size of the game (Disk space) with this concept of location would be acceptable. If the developers will stop on this variant, in this case Europe, Asia and South America have quite a lot small countries that have an interesting infrastructure, rich history and colorful architecture. Of course, Liechtenstein, Monaco or Tuvalu are unlikely to become one of these countries. Well, they are really very small. But Italy, Spain, Germany or the UK could easily become such country that will serve as the basis for the location of Grand Theft Auto 7. The map will include all of the US states. This variant is very like many gamers, because in such a large area, everyone can find something familiar and favorite, or come to know some new territory that had never visited before. This version sure very interesting, but it requires a large amount of disk space to create such a huge map. It is doubtful that gamers will buy several additional hard drives just to play GTA 7. As at present the latest version of Grand Theft Auto with the biggest map is GTA 5. It consists of the city of Los Santos (Los Angeles) and the adjacent territory Blaine County, and it takes 65 GB. With this in mind, it is difficult to imagine how many DVDs will be needed for GTA 7 “USA” for the PC. 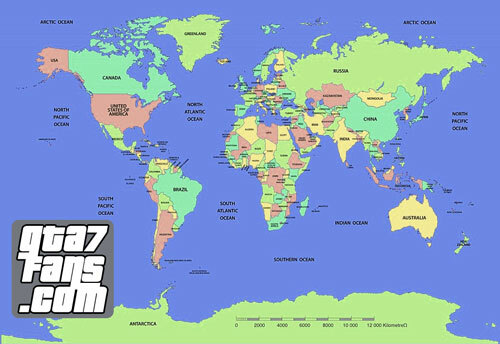 GTA 7 Location will include all the cities and countries of the world. In other words, you can set your hometown and start the game from your native location and gradually increase the control area. Move freely between countries and cities using ground, water and air transport, visit your favorite country’s places. This conception sure quite optimistic but if you remember that GTA 5 in the PC version took 65 GB of disk space, you can only imagine how many will take GTA 7 PC in this variation. Of course, developers can split the “World” into separate locations, and if necessary, download new maps from the Internet. This fact alone suggests us to think that this concept is not so fantastic as it may seem initially. In addition, given the rapid evolution of technology most likely by 2022( GTA 7 Release date ) there will be a small flash drives, but with a huge memory capacity. And then we will not have to worry about how much Disc space will hold the game. Also, there is a high probability that the GTA 7 will be a symbiosis of offline and online games, and you will be able pass the game together with your friends, make new acquaintances, reflect the attack from the rival gangs and seize new territories. Whatever it was, but definitely the developers have a lot ideas to surprise us in near future, so we will wait and follow the news and rumors about them. We will update this post every time when we will get some new portion of rumors or news related to Grand Theft Auto 7 Location. So, what do you think about these conceptions? Please let us know your opinion using the form below. Cameron, i am 10 and i play gta who cares of age restrictions!!!!!! Grand Theft Auto 7 – Let’s Make a Wish List!